The Aqua-Pure® Complete Drinking Water Filtration System is an economical undersink alternative to bottled water that connects to a dedicated faucet. This system reduces sediment, chlorine taste and odor, lead, cyst, mercury, asbestos and select VOCs. 1/4" push-in fittings and tubing included. Rated at 0.75 gpm flow rate and 750 gallons capacity. Includes polished chrome dedicated faucet and tubing. This 3M AP Easy Complete Water Filter System is an original product from USA. It is suitable to be installed under the kitchen sink. With a standard installation, water is splitted from the incoming water tube (normally located in the undersink cabinet area), and feeds into the filtration system, and then comes out through a separate faucet. 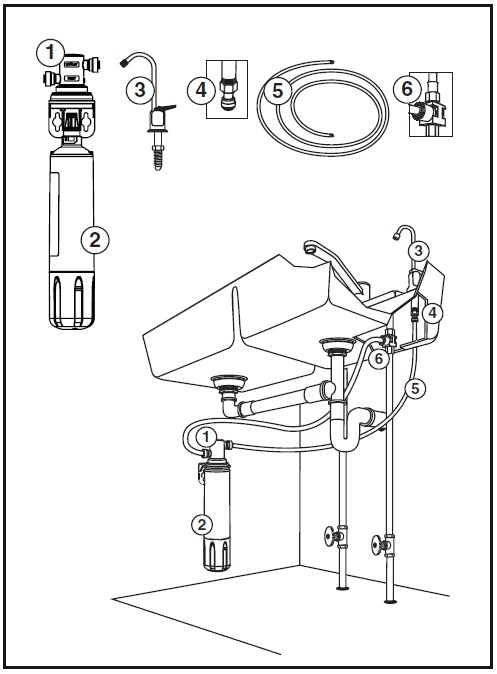 Also, for the installation of the filter faucet, one needs to drill a 9/16" dia. hole on the counter top. *** IMPORTANT: This is an under sink system, this standard package does NOT include any adapter to take the water from / to main water tap.